Betsy Hoyt is practically Wonder Woman. A personal trainer, nutrition coach and small group fitness instructor, Hoyt specializes in perinatal fitness, teen athletic conditioning, as well as senior citizen and de-conditioned adult training. 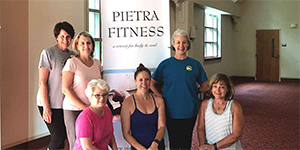 She started her personal training business, EDH Solutions, LLC, in 2015 with the purpose of “promoting the feminine genius through intentional fitness and nutrition.” She teaches the Pietra Fitness technique, a holistic “body and soul” exercise program. With more 350 clients every quarter and five classes per week, Hoyt needed an efficient way to organize participants. “Using SignUpGenius has transformed my ability to organize and streamline customer service for my clients and class participants,” she says. Hoyt, who is based in Huntersville, N.C., offers classes throughout the Charlotte region. She says one reason she loves using SignUpGenius is it allows her to reach people in specific areas by creating localized sign ups. Other features that Hoyt finds useful are automatic confirmations and reminders (which allow her to “reach out to new participants immediately in order to personally connect and encourage their participation”) and the ability to export reports. And Hoyt doesn’t just use SignUpGenius for professional purposes. We are honored to help Betsy make a difference at work and in her community. That’s genius!